Taken from the roof terrace of my building on 52nd Street and 10th Avenue. This is a truly stunning shot. It could be a very interesting cloud study. Thank you for visiting and liking my post “Ready for Push Off”. Very dramatic. This looks like it could have been taken 60 years ago. Very nice. Thanks! I really enjoy the B&W. How do you get up there? NYC photographers always make it seem like it’s nothing to get access to any roof in the city. In my neck of the woods, property owners and managers ensure that everything is locked up like Fort Knox and requiring special DefCon security passes (and a lawyer in the back pocket). I’d love to be able to easily get to a roof here, there, anywhere to get some eadle-eye use of my equipment. love this 🙂 good capture! Looks like a still from a 1940’s movie! That really is an amazing shot! 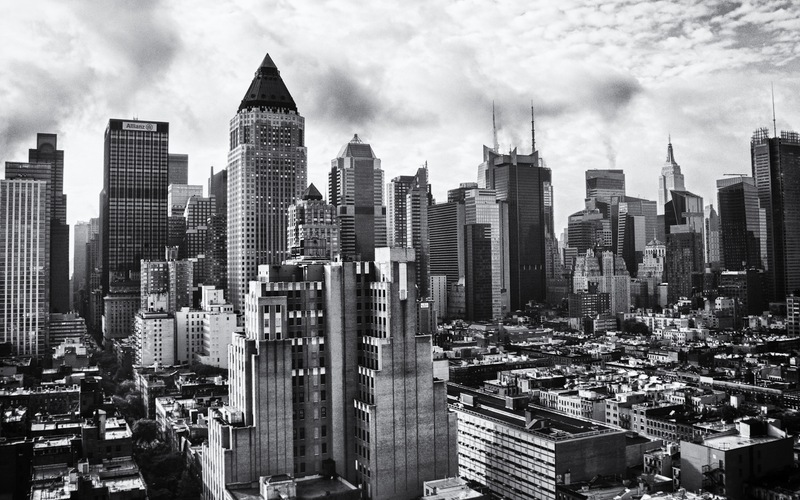 Black & White is so awesome and you captured this urban view perfectly! Thanks! All I can recommend is; keep posting regularly (2-3 times a week) and visit other blogs for ideas and inspiration. Lutz, is this image available for licensing? My client (a local hospital) may like to use this as a background for their newsletter. It is. How many people would the newsletter go to? This is an amazing picture, love the view, captured beautifully! i found this picture via google images (low res). I want to ask for your permission to use this as a background for the following double exposure image. (for non-commercial purposes). I will give proper credits and mention to you wherever I’ll share it. If u like the my double exposure work, u can also share it. Yes, you have my permission to use it. Enjoy!